26-year-old rapper and artist Kohh endured a brutal upbringing – a father who committed suicide, a mother addicted to meth, his home in an area blighted by violence and drugs – yet it’s a childhood that, on a superficial narrative level, could be familiar to anyone with an interest in US hip hop. That Kohh grew up in the Oji district of Kita in northern Tokyo, however, is fascinating. It’s also biting in its instant subversion of the cliches around Japanese culture – predominantly kooky, geeky, and passive – and an example of a darkness little known to those outside the country and unspoken by many within. 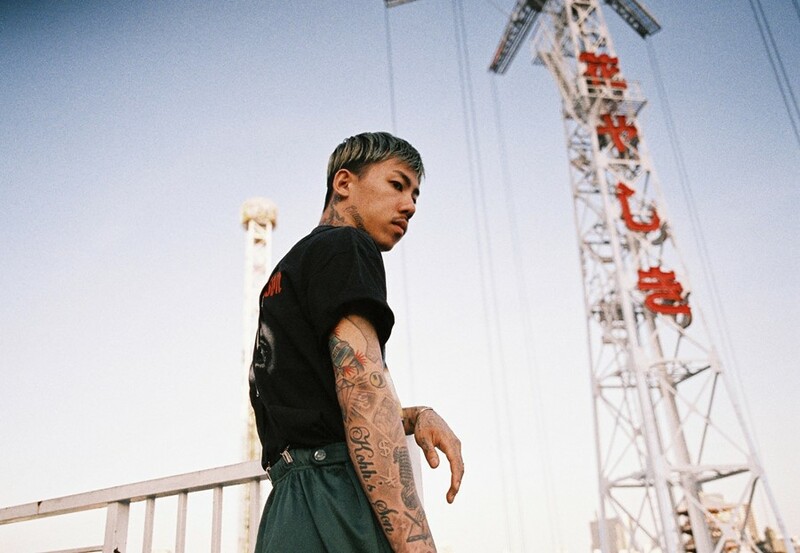 Kohh, who still gives props to his neighbourhood and crew on his records, puts this into the public sphere on “Dirt Boys”, a sinuous trap beat over which he namedrops pricey fashion labels, dismisses those sneering down at who they are and where they’ve come from, and espouses staying true to yourself. Kohh sees no reason to shift away from his roots, despite some of the memories it holds and his growing success. “Your hometown will always be your home,” he avouches. The Bardos discovered Kohh online during what they describe as a “quest” to find a way to convince their producers they needed to go to Japan. “I guess we really discovered and unraveled him when we started shooting,” they explain. “He came to life in a very organic way for us. We had no preconceived ideas or prior knowledge, we just liked his music and his style, but it’s always more fun to take a walk on the dark side and he seemed like the guy to do it with.” Their film captures the artist’s duality – a firebrand on-stage, reticent and softly spoken off it. His replies are precise and unwasteful; everything that he really wants to be known lies within the music he makes.